Hey! Here’s a Really Cool Movie. An award-winning brewer with over 30 years experience, owner Tim Herzog made a strong commitment from the inception of this company as merely an idea to establish Flying Bison Brewing Company in the City of Buffalo and foster the return of what was once a flourishing industry. It’s this commitment that has carried the way for the brewery to become what it is today. Please enjoy all Flying Bison beers responsibly. 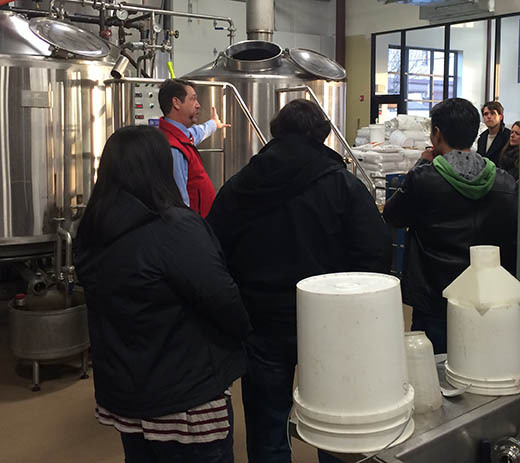 Want to tour a factory where BEER is made? We thought you would. Tours are given at 6:00pm on Thursdays & Fridays, and on Saturdays at 1:00pm & 4:00pm. Rarely, due to large events or production in the brewery, we will not be able to do a normally scheduled tour (if/when we do, we shall post that info on our Twitter feed and Facebook page). Our beers are available to sample in either in a “flight” – a 4oz sample of 4 of our styles or you can enjoy a pint of one of your favorites. We would love to have you and your group come for a tour but please be aware that we are a production facility and as such, are not always able to accommodate times outside of those hours due to production and staff responsibilities. We thank you in advance for your cooperation and as always look forward to your next visit. We welcome groups to come visit our brewery and tasting room. However if your group is larger than 12 people please call or fill out this form at least 12 hours before your arrival as we need to staff properly for large groups. We reserve the right to deny entry to unscheduled groups if we don’t have sufficient space or staff to comfortably accommodate the group. Also, please be aware that we also have the right to deny alcohol to any member of the party that is visibly intoxicated, and they may be asked to leave. Thank you for your understanding.